When your pet suffers from a sudden injury or chronic pain, you want him or her to receive relief and feel better. You can rely on 1st Pet Veterinary Centers to provide your pet with effective care and treatment, which may include laser therapy. Laser therapy is not new. During the 1970s, initial research indicated that laser light has beneficial effects on biologic tissues. Since then there have been many advances that now allow this modality of treatment to be offered to our small animal companions to reduce inflammation and pain, and improve circulation and healing. Here at 1st Pet Veterinary Centers we have several locations in the Phoenix, AZ metropolitan area that practice laser therapy for pets because it brings positive results to our patients and improves the quality of life for them and their owners. For how Long Does My Pet Need Veterinary Laser Therapy? Our certified veterinarian and veterinary technicians use a non-invasive laser headpiece to stimulate damaged cells, leading to an increase in blood circulation and a reduction of soreness and inflammation. As your pet feels the gentle soothing warmth from the laser, he/she will likely relax and enjoy the treatment as though receiving a soothing massage. The therapy session may last as little as a few minutes or as long as the better part of an hour, but varies depending on your pets individualized therapy plan. Depending on your pet’s condition, some may only require a few treatments, whereas others benefit much more from receiving ongoing laser therapy on a monthly basis. Many of the pets treated with laser therapy actually seem to look forward to coming in for their next treatment! When Should You Choose Laser Therapy? For acute conditions or injuries, laser therapy can reduce the pain of healing and help your pet recover sooner. For chronic conditions, keep in mind that while animal laser therapy may not definitively cure your pet’s malady, it will provide relief and allow your pet to enjoy an improved quality of life. In addition, laser treatments may allow your pet to require less pain medication over time. 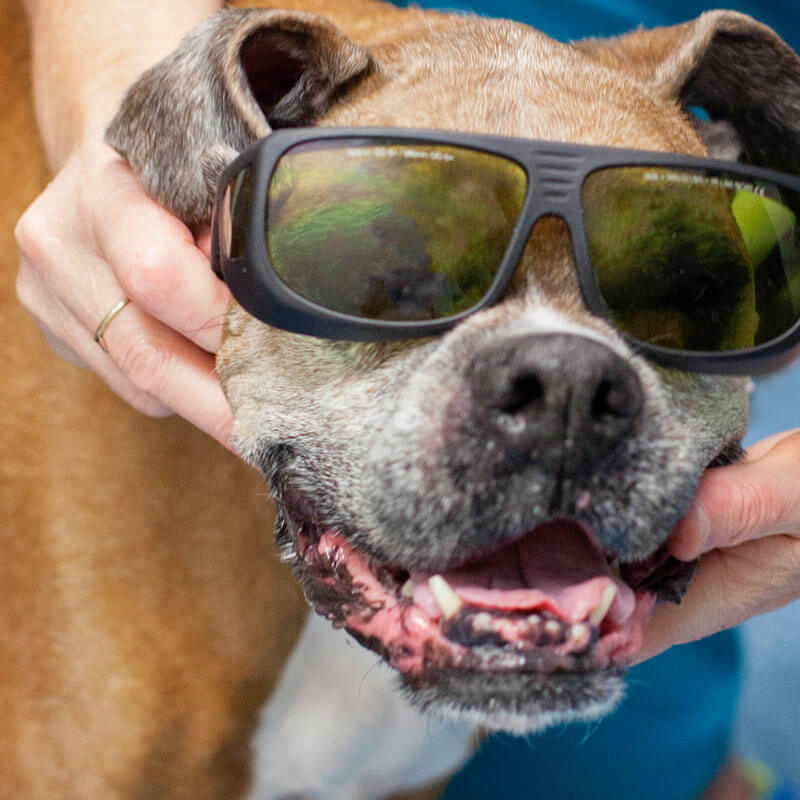 For years, the staff at 1st Pet Veterinary Centers have offered innovative laser therapy for cats and dogs. We care deeply about your pet’s physical well-being, and we prioritize your most pressing concerns. Allow us to give your pet the respite he or she deserves. If you think your pet could benefit from laser therapy, schedule an appointment today with a member of our team to create an individualized treatment plan. Then, visit us at one of our three hospitals in North Valley, Mesa, and Chandler, AZ.